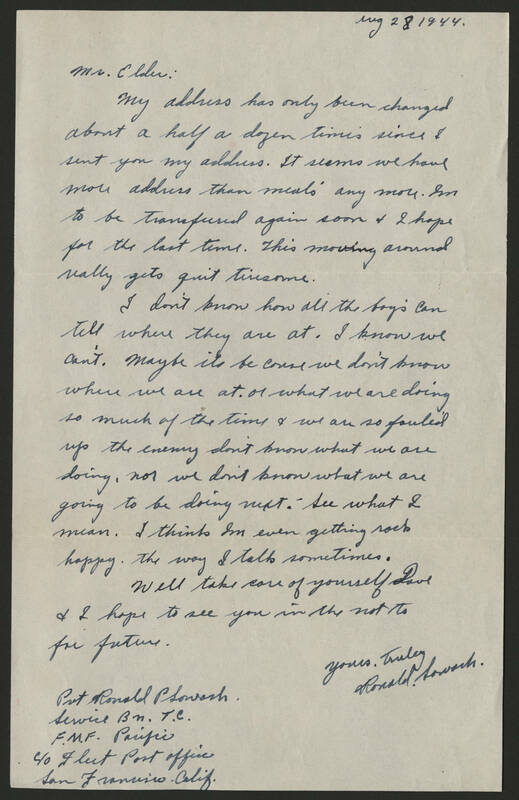 May 28, 1944 Mr. Elder: My address has only been changed about a half a dozen times since I sent you my address. It seems we have more address than meal's any more. I'm to be transferred again soon & I hope for the last time. This moving around really gets quit tiresome. I don't know how all the boys can tell where they are at. I know we can't. Maybe its because we don't know where we are at. or what we are doing so much of the time & we are so fouled up the enemy don't know what we are doing, nor we don't know what we are going to be doing next. See what I mean. I think I'm even getting sock happy the way I talk sometimes. Well take care of yourself Dave & I hope to see you in the not to far future. Yours truly Ronald Sowash Pvt Ronald P Sowash Service Bn. T.C. F.M.F Pacific c/o Fleet Post Office San Francisco Calif.